After 6 summit acticvations (and one lighthouse) with more than 300 QSOs 5B/DF3MC/p is QRT for now. Thanks a lot to all chasers who made this trip very exciting for me. I had nice pile-ups on each summit. I found great summits here, nice hikes and friendly people. I hope to see a lot of activity from this new association in the future. Thank you for all the work to start this association, and a special “Thank you” to the Association Manager, 5B8AP for valuable advice. The logs will be entered after return home. I still do my logging on paper, so some “homework” is to be done. Mrs. FMF has wanted to visit Cyprus for a while so we may have a family holiday there plus SOTA later this year. It’s good to know there are some people out trailblazing so I can ask questions should we decide to visit. Great job Martin - the daytime skip distance to UK from Cyprus is perfect for us on 20m and you have been a consistent 559 - 579 signal on the 5 summits we worked. I got a little confused with the Lighthouse activation which I spotted as SOTA when we also worked, but thanks to Fabio IK2LEY tipping us off quickly I removed my spot within a few minutes. I remember our meeting and drinking with your friend in his garden very well when I was in Garmisch with you on the night of the EU Remain / Vote Leave referendum on 23 June 2016. The midsummers night intentional fire making on all the mountains around the town was a memorable experience. I also remember paying my hotel bill on the morning of 24 June 2016 when we went to Friedrichshafen and paying more than £100 more due to the fall in the pound overnight! Glad to say we remain a member of the EU for the foreseeable future, it looks to me like we could remain until Halloween and maybe forever, but no one is sure here what will happen. The journalists and MPs are now having a two week holiday to recover from the extreme politicking and the making of “hot air” which has taken place since Xmas! 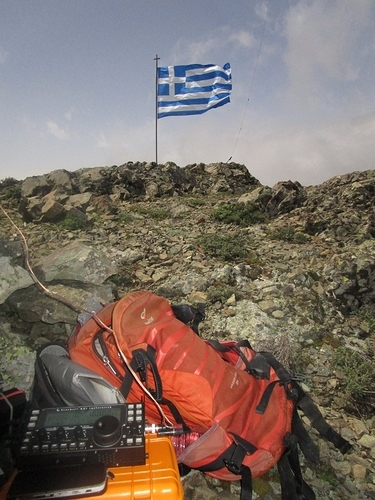 Cyprus looks to be an excellent SOTA destination, you did very well there this week. I would like to visit for sure, now there are now a good hadfull of SOTA Completes for the taking! Good news that Andy and Mrs FMF are going there also. Hopefully I will be at home and not SOTAing somewhere myself when they are in 5B… Czechia in May, France in July and Austria in August already booked for me.